One of the most popular chips available in market these days are these potato chips (or potato wafers as they are called here). 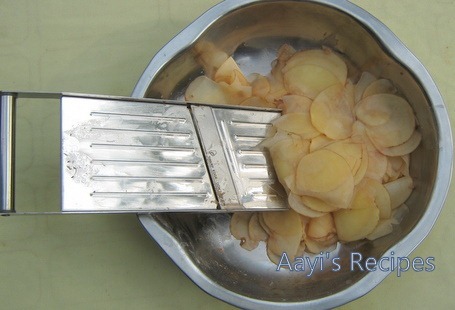 We make chips from raw jackfruit, plantain/banana, breadfruit etc. Since these are readily available in market, I make these very rarely. Many of you requested for this recipe, so I thought of posting the recipe here. For these chips, you have to select big sized potatoes to get chips of larger diameter. Use a mandoline slicer to get uniform pieces. In order to make them stiff, we generally put them in ice and water for about ten minutes before frying. In a bowl, mix a tea spn salt with half cup water and a pinch of turmeric powder. Keep it aside. Wash the potatoes well. Do not peel off the skin. Using a slicer, make thin slices. 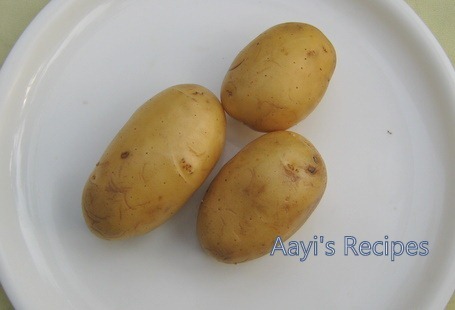 Place them in a bowl with ice cubes(7-8) and water for about ten minutes. 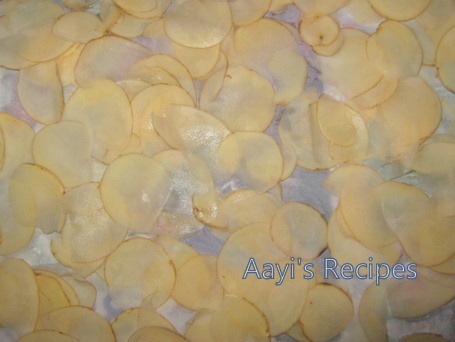 Spread them over a paper or cloth for about 20 – 30 minutes till they get dried up. chips from the frying pan. 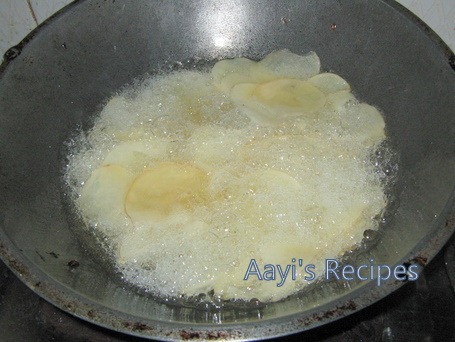 Spread them on a paper so that much of the oil is absorbed by the paper. in an airtight container when they are cooled to room temperature. I really like your recipes and have tried out a few with good results. I wanted to know why you added water to the oil after the chips are almost done? Does it make them crisper? SJ, the salted water is added for taste. If you sprinkle salt over the chips after they are done, it does not get soaked into chips. Nice step by step explanation :)will try adding ice cubes . My blog should be up and running by next week…finally after my bog being kidnapped now I will be with WordPress. 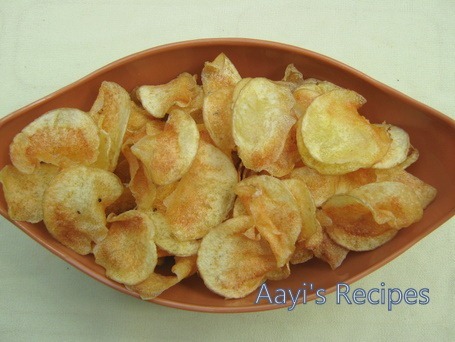 Shilpaji very excellent and with new method with ice pototo chips. I love this thin type wafer very much. Awesome! It has the same look of store bought potato chips. Yummy! I want some of these. superb..but adding water to hot oil!!! !..doest that splatter oil every whre and would we be able to use that leftover oil again ? 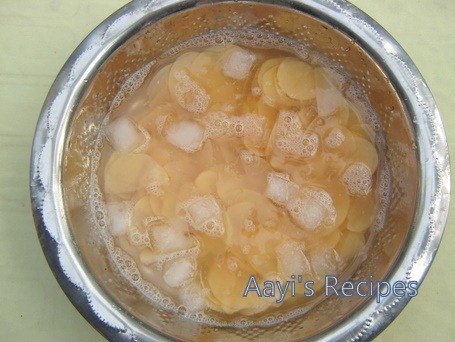 It is better to soak the potato slices in salty ice cold water. Then there is no need of adding salt water later .